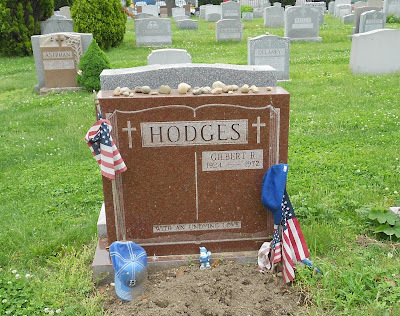 Buried in Brooklyn's Holy Cross Cemetery, visitors often leave baseball memorabilia at the grave of the beloved former first baseman, and New York Mets manager. Hodges suffered a fatal heart attack, in 1972, after playing a round of golf in Florida. On what would have been his 48th birthday, over a 1,000 people waited on line outside a Brooklyn funeral home hoping to be admitted to pay their respects. On the day of Hodges’ funeral fans stood behind police barricades for a glimpse of Hodges’ casket as it was being brought into church. Baseball luminaries --among them Baseball Commissioner Bowie Kuhn, players Pee Wee Reese, Jackie Robinson, pitchers Tom Seaver, Sandy Koufax, and sports announcer Howard Cosell --filled the pews. Brooklyn Bishop Francis J. Mugavero was the principal celebrant, while Hodges' pastor and friend, Father Charles E. Curley, gave the homily. ”Gil was a hero. All of us need heroes, though lately they seem to be in short supply. Here is one to look up to and imitate,” he told the congregation.